One of Ten Famous Teas, she has the rare combination of full-bodied sweetness and delicate floral aroma. A customer once said to me that "green tea tastes like warm dishwater. It is too bland!" It is a view I have some sympathy with. When I first started drinking high grade green tea, I feel instantly energized and refreshed, but couldn't taste anything. The "Aha" moment only arrived two weeks later when I finally appreciate the rich body and light floral fragrance. If you were like me, I have two recommendations. While most Chinese green teas have a light body and subtly floral aroma, the native tea plants of Yellow Mountain beg to differ. The first is the enormously popular Taiping Houkui tea, commonly refers to as the Monkey tea. The second is this Liuan Guapian tea. also known as the Melon (seed) tea! Both teas are young, having been invented around 1900s. Both teas are one of the Ten Famous Teas. There are more than 700 Famous Teas, a tea has to be damned good to get to the top! What both teas have in common is that they are harvested from the large tea bushes native to Anhui province. Unlike the more common small tea bush, they have thick branches and large leaves. 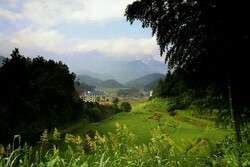 The word Liuan refers to Liuan county. The mountainous region has been growing tribute tea for the Chinese emperors since Tang dynasty (618 to 907 A.D.). The word Guapian means melon seed. As you can see from the photo at the top of this page, the tea leaves have been rolled into a curve like a sunflower seed. She is a late harvest variety. Tea leaves are plucked in late April (during the "After Rain") for ten days. The making process - the most unique and sophisticated of any Chinese green tea - combines the best of tippy green tea, big tea bush and scented tea. While a Dragon Well tea is roasted on the same day, the Guapian tea can takes up to a week to make. The most labor intensive is the stage of "Old Fire", when the leaves are roasted for the third time. First, the farmers create a hot furnace using 40 kilograms of smokeless charcoal. Then the tea leaves are roasted on top of the furnace five seconds at a time. Next, the leaves are left to cool briefly. The farmers turn over the leaves slightly, before repeating the whole process again. The amount of "fire" has to be exactly right. 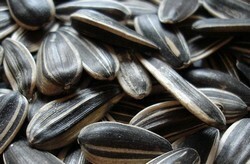 Too little can cause astringency, while too much can cause bitterness. Furthermore, the tender leaves have to be reduced to 6% moisture, while finally looking like a melon seed. An incredible laborious process, this is repeated 120 to 160 times. It is said that a farmer can walk as much as 10 kilometers in a day. For this reason, she is widely regarded as the most sophisticated of Chinese green tea. 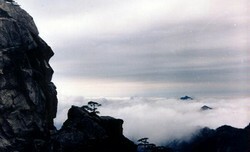 The Liuan Guapian tea grows in the Dabie Mountain of Eastern China, which has been granted the National Forest Park status in 1997. Scientific studies have found that the Mountain fosters superb conditions for growing tea plants that is rich in antioxidants and theanine. The soil is rich, with a thickness of more than 1.5 meters. It is slightly acidic, with a PH level of less than 6. Rainfalls are plentiful and average 1,250 millimeters a year. Most tea gardens are found in the mountain valleys with rich soil and good drainage. For the 2015 season, we have switched to a different supplier and we do believe this AA grade Liuan Guapian tea will offer even more value and quality. The leaves are small, tender and uniformly sized, without any buds and stems. While Chinese green tea usually has a yellowish green liquor, Guapian tea offers something different. Try drinking her with a white porcelain. Admire her olive green liquor with a golden luster. The taste is full-bodied, with an unforgettable delicate, floral aroma and long lasting sweetness. I would give the Liuan Guapian a 5 out of 5. I am basing that on a comparison to the same tea that I purchased from one of your competitors. Your tea was much fresher and was much richer and full bodied. Very fresh tea. I have not had tea of this quality since I was stationed in Asia with the Foreign Service. Please feel free to publish my comments. Thank you again for the wonderful service and tea. 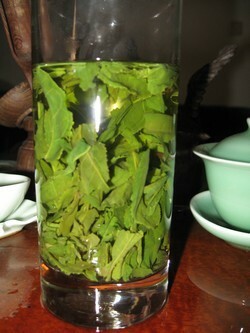 Had the Liuan Guapian today again, what a great green tea. Similar to the Tai Ping in taste and aroma, it's like liquid Asparagus but somewhat sweet. Will have to brew this different ways and see how it changes in tasting. Your brew tips are great but the taste really comes through after it has cooled down a bit! 5 out 5 I think, it's one I'll reorder. Hey, as always, the teas are excellent. This is the first time I've tried Liuan Guapian. I really enjoy this tea, it is full bodied and less subtle than some of the others. I prefer to steep it with a bit more tea than the other greens, around 3 grams per cup. To me, this enhances the flavor and helps to play up the tea's richness. I have now tasted the Liuan Guapian and she has a pronounced but not overbearing taste and I enjoy her a lot. I will probably reorder both her and the Moli Jinzhen which I am enjoying since quite some time now. For my taste and for quality/price-ratio: a five. I brewed Liu An Gua Pian to relieve that dampness of a cold, rainy day. It seems a well balanced tea of noteworthy character and sufficiency. Still there is nothing greater than oolong and it's floral olfactory element that transcends the senses. Liuan Guapian tea should be brewed the same way as the Dragon Well tea by infusing a small amount of leaves in high temperature water for as long as it takes. For further information about packaging, brewing, maturation and storage, read Dragon Well Tea - Further Guide.